Michelle, why should people care how much water they use on their yards or gardens? In many regions, water is scarce. Some cities covered in green lawns and spouting fountains are actually in the middle of dry deserts with little rainfall. But we don't need rain. We can turn on the sprinklers and give our pretty lawns as much water as they need. Right? No. In order to live in these places, people have to dig deep wells to find water. Or they have to pipe water in from lakes or reservoirs. City dwellers often forget that they need to conserve water so they don't run out completely. We have had a drought in Southern California for several years. But that's just temporary, right? Not in the long run. Earth's climate is getting warmer, so drought will probably become much more common and severe! For many regions, global warming means less snowfall in the winter, so less water in lakes and reservoirs. So, back to landscaping, I guess we should all just let our lawns turn brown. Not at all! That's the great thing about xeriscaping. 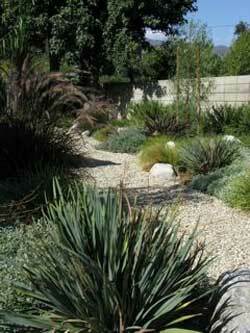 Xeriscaping is creating beautiful, natural-looking landscapes that need very little water. What plants don't need water? You can find out by looking at what plants grow wild where you live, or in other places with similar climates. For us, that would be the region around the Mediterranean Sea, as well as some coastal areas of South Africa, Australia and Chile. 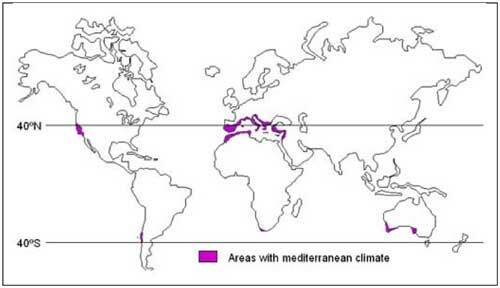 This map shows regions with a climate similar to California's Mediterranean climate. Your region may have a tropical, temperate, arctic, desert or other type of climate. That must include a lot of plants. Yes! Not all of them are so easy to buy here, but we have lots to choose from. 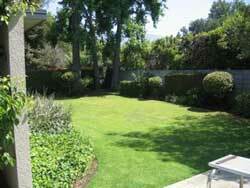 Most nice, grassy lawns need tons of water to stay green. Some kinds of grass do take less water. You can also have a lawn substitute. Yarrow and some native sedges are soft to walk on, need little water, and don't need to be mowed. But you don't really need a lawn at all. No lawn? Then where would we play? And where would the dog . . . you know. OK, for children and pets, you could have a small lawn area-say in the back yard. 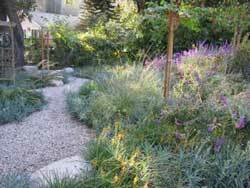 But the rest of the yard could be designed with only drought-tolerant plants such as lavender, rosemary, beautiful tall grasses, wildflowers, cactus, succulents, and lots more. Could you even walk through a yard with these kinds of plants? Absolutely! You could have curving, natural-looking pathways with flat stones or gravel to walk on. Sometimes we create a little dry creek bed with smooth river rocks winding through the plants. We make people's yards look like nature at its most beautiful! 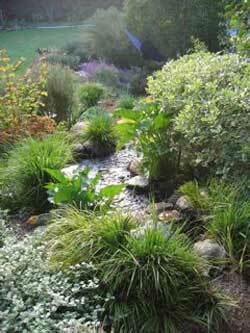 These landscapes are much nicer homes for wildlife, too, such as insects, birds, squirrels, and rabbits. And these plants never need to be watered? They may need some water at first. But once their roots are established, usually rain is enough. Are there any other ways you help with climate change in your job? We also help people set up water-efficient vegetable, fruit, and herb gardens. By growing their own food, people prevent a lot of carbon dioxide from getting into the air, because no trucks or planes are needed to deliver their food from far away. Also, their plants take carbon dioxide out of the air. Your job sounds like fun. What do you like most about it? I love being outdoors! I love creating fun landscapes tailored to people's likes and dislikes. I love teaching people to be responsible with the environment. It sounds like we can all be horticulturists in a small way. Thanks for being such an inspiration, Michelle! 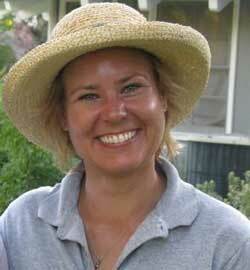 Michelle loves to be outdoors creating Earth-friendly gardens. Before landscaping by Michelle, this lawn was dull and patchy. After Michelle's redesign, this yard is not only beautiful, but eco-friendly! 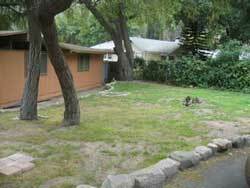 Before xeriscaping, although this grassy lawn is beautiful, it takes a lot of water to keep it green. After zeriscaping, this yard is just as beautiful and even more interesting. The birds and bees like it better too. In Southern California, streams are often dry. Even so, they are beautiful, as this one designed by Michelle. Succulents come in many colors and shapes. Their leaves are plump with water, but they need very little to thrive. 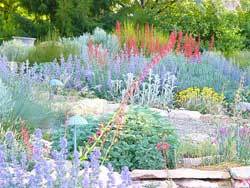 Drought tolerant gardens can be just as colorful as any!